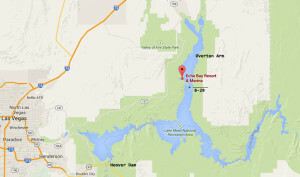 The B-29 Bomber is located up in the Overton Arm of Lake Mead. It is by all accounts in a REMOTE location. We launch our boat from Echo Bay Marina – Launch Ramp. 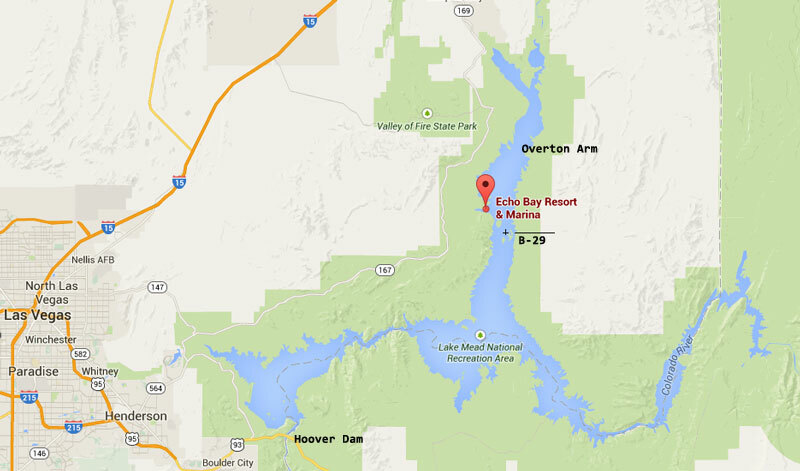 It is approximately 1 hours drive from either the Boulder City or Henderson Park Entrances. Echo Bay has an RV park and a small convenience store. The old hotel and marina that was there is no longer operating. However, we launch our boat from the launch area there as it is the closest location to the B-29. As a remote location there is rarely good cell phone service. Because of this we respectfully request that you give yourself ample and sufficient time to get to the launch ramp for your scheduled departure time. We will not be able to be reached if you are late. And if you are late, you have a good probability of missing the boat. You can stay in Las Vegas at one of the casino hotels. Keep in mind that getting in and out of those places can be challenging so allot for 2 hours travel from the time you leave your room to the time you arrive at the launch. We stay at the Hacienda / Hoover Dam Lodge in Boulder City, NV it is a convenient Hotel/Casino just a mile from the Boulder City – Lake Mead Park Entrance.